Last Monday, Keith Oatley described recent brain imaging research demonstrating the way that reading fiction prompts the simulation of complex experiences in the brain. And Melanie Green’s post this past Monday provides an additional jumping off place for thinking about visits to the narrative world via novels or film. Comics, as I’ve been musing this week, provide an interesting kind of middle ground between novels and film – they are themselves already a sort of simulation of what’s going on in the story, and as most children recognize, provide a compelling platform for cognitive effort in reconstructing a story: for those with low cognitive needs, the story is there, laid out and illustrated; for those with high cognitive needs, comics provide what Scott McCloud calls “a call and response,” in which the artist gives you something to see in the panels and something to imagine between the panels. In the McCloud TED lecture I discussed on Wednesday, he argues that comics offer messages for all senses funneled through the conduit of vision. As a landscape researcher interested in narrative, I find the implications here fascinating for a number of reasons. One can easily imagine the rich signals that McCloud describes as capturing essential qualities of sound and texture being simulated in the way that Keith discusses – and in a way perhaps closer to our non-reading experience than the simulation of narrative straight from text might be. Comics can show what's happening around the story without breaking up the flow of narrative. Consider how much of the "interior" narratives of modernist writers like Virginia Woolf are about reactions to exterior phenomena, often settings – and this took a revolution in narrative to achieve, while “comics” representations have been around at least since the pyramids. Although much more attention has been paid to the nominal centerpieces of fictional narrative, such as characters and plot, setting is less often explored (less often than I would like) – but in comics, although it may be abstracted, setting effectively is the medium: especially in the vernacular used in The Watchmen (the inspiration for this series of posts, which will continue on Monday) each image has a place. Every line of the call and response provides a visual template of place, space, and setting, and in so doing, enables a very different read than straight text or illustration. 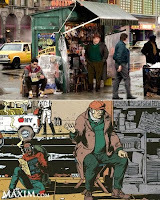 As a slight tangent, I end with two recent prints by Erik Waterkotte that draw attention to the vocabulary of comics space and setting – beyond the imagery of The Watchmen (which will no doubt be becoming increasingly familiar to readers where the film is being publicized – Raymond reports a facsimile newsstand, pictured above in the comic and the movie set, having appeared in Toronto).